Truly! 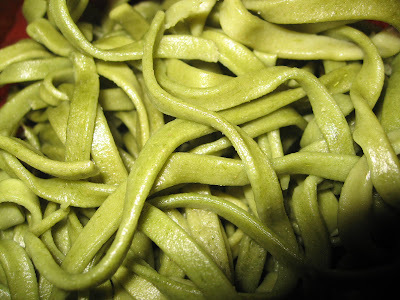 Made this on the weekend - fresh spinach fettuccini, using my pasta machine, which I love. Just steamed one bunch of coarsely chopped spinach, let it cool in the liquid I cooked it in, mashed some more with a hand masher, and then used the kind of soupy broth as the liquid in the pasta. At first it seems like there will be big green blobs, but as you work the dough, pass it through the rollers etc, it becomes much more evenly coloured, and gets that very exciting extra special silky fresh pasta feel. Also did some plain dough and made pumpkin ravioli, with roast pumpkin, zucchini and finely chopped and sauteed onion and garlic. Yum! oooh a pasta machine. Nice! By the way I've got two pots busting out with parsley and three with basil, all that I grew from seeds and thinned out at the beginning of spring (when it was snowing). Does that count as craft?